Throughout my musical education, I’ve been taught that music happens in a linear space. This is the space so beautifully laid out on the piano keyboard. Music teaching is organized around scales. In most Western music, the full scale consists of twelve notes, equally spaced. Other scales, such as the seven-note minor and major scales, are subsets of this full, “chromatic” scale. Due to octave magic, a mysterious and crucial aspect of our inner perception, when we get to the thirteenth note, we have multiplied the original note by two, and the sequence starts over again. So, fortunately for musical analysis, melodic space can be described in one octave. It takes about ten of these octaves to cover the range of human hearing. On the piano keyboard, melodies look the way they sound. When the pitch goes up, you move up the scale, and when the pitch goes down, you move down the scale. Short distances (the shortest is from one key to the next, a half step), feel short. Long distances (more than about three half steps) feel long. This is a good and useful space for visualizing melody. Musical nomenclature, as I’ve pointed out before, has grown like an old city over the years. As music theory changes, bits and pieces of the old terminology are appropriated and redefined by new thinkers. The result is a cobbled-together mass that has a lot of weird contradictions and misleading names. I think one of the most regrettable bits of confusion comes from the word interval. 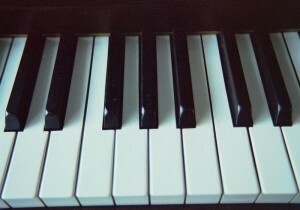 The distance between two notes on the keyboard is called an interval. When my melody moves by an interval of a minor third, it has covered a distance of three half steps. When I move by a major third, I’ve covered four half steps. The major interval is bigger than the minor one — that’s why it’s called “major.” No problem! The move feels bigger when you sing it. The problem comes when you start to think about harmony — two or more notes sounding simultaneously. The word “interval,” with the same connotation of pitch difference, is also used to describe the distance between harmony notes. Yet in the world of harmony, the interval, or pitch distances don’t make any intuitive sense at all. For example, two notes a fifth apart (seven half steps) sound wonderful when played together. C and G are two such notes. They are closely related to each other, harmonically. So are C and F, which are a fourth apart (five half steps). These are the best consonances there are, except for unisons and octaves. So what about the note in between them, an interval of six half steps? Yep, none other than the dreaded tritone, the devil’s interval, definitely a dissonant note. If the linear scale were the best way to think about harmony, wouldn’t the tritone be between the fourth and fifth in consonance? Why would three notes in a row, next-door neighbors on the scale, be so drastically different from each other harmonically? The scale gives no clue. You just have to remember. Perhaps there is a more intuitive way to visualize harmony, one that puts harmonically related notes closer to each other, and puts the notes that are harmonically farther apart … farther apart? I think there is indeed a harmonic space as distinct from a melodic space. This space can be illustrated on the lattice. It’s not a good model for melody — scales do a much better job. But it’s a great model for visualizing harmony — what you see corresponds intuitively to what you hear. The interplay between these two spaces creates the beautiful dance that is harmonized music.